Leicester chairman Milan Mandaric says he has turned down an approach from Bolton to talk to manager Gary Megson. Managerless Bolton have already been refused permission to speak to Real Sociedad coach Chris Coleman and Birmingham manager Steve Bruce. 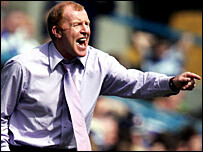 Megson recently became Foxes boss and Mandaric said: "I'm a great believer in loyalty, trust and integrity. "Gary made a commitment to this club, the supporters and myself and I fully expect him to honour that commitment." He added: "I therefore have no doubts in my own mind that Gary will reiterate his commitment when he talks publicly in the next 48 hours. "It is also important to point out that, contrary to claims today, Gary Megson has not spoken to Bolton Wanderers and furthermore is bound by a legally binding contract at Leicester City Football Club." A spokesman for Real Sociedad said: "We told Bolton that Chris Coleman has a three-year contract. "We are delighted with Chris Coleman and we want him to see out his full contract with us." BBC Sport understands that former Wigan boss Paul Jewell has also been approached by Bolton. Jewell was in Bolton on Thursday as the Premier League club continued their search for a new manager. The 43-year-old left Wigan at the end of last season after ensuring the Latics remained in the Premier League and has been out of work since. Bruce is also in the frame but he wants to hold talks with prospective new Blues owner Carson Yeung about his future at the club. He had hoped to speak to Yeung this weekend but said: "I have received a message that Mr Yeung is not available this week. "He might be available for the Wigan game next weekend. "I will have to be patient for another week. I am not the sort of person who likes to do things via text messages or emails. "I would like meet Mr Yeung face to face to see which way the football club is going to go. "When that meeting happens, I might be able to tell you a bit more. Until I meet Mr Yeung, not much more can be said." On Bolton's interest, he added: "It's flattering. "My first reaction was obviously they've seen the decent job I've done and I'd like permission to speak to them. That hasn't been granted so I'll accept that." Bruce had negotiated a new deal with Birmingham's current board but Yeung has not yet rubber stamped the contract. And Bruce recently made public his fears his six-year reign at the club may be coming to an end. "Steve is uncertain about his future at St Andrews amid rumours that if Yeung does complete his proposed takeover by Christmas he won't be there much longer," said Radio 5live football reporter Pat Murphy. "In his heart of hearts, Bruce wants to stay at Birmingham although he feels he is now in limbo. "Perhaps Bolton's regard for him may at last prompt Yeung into public support for Bruce." Graeme Souness and John Collins have also been linked to the club.